10mm Coroplast is a High-Quality Polypropylene Twin-Wall Profile Sheet For Use in The Screen Printing, Display and Packaging Markets. 2.5 mm Coroplast is a High-Quality Polypropylene Twin-Wall Profile Sheet For Use in The Screen Printing, Display and Packaging Markets. 2mm Coroplast is a High-Quality Polypropylene Twin-Wall Profile Sheet For Use in The Screen Printing, Display and Packaging Markets. 4mm Coroplast is a High-Quality Polypropylene Twin-Wall Profile Sheet For Use in The Screen Printing, Display and Packaging Markets. Coroplast is a high-quality polypropylene twin-wall profile sheet formulated specifically for use in the screen printing, display and packaging markets. 6mm Coroplast is a High-Quality Polypropylene Twin-Wall Profile Sheet For Use in The Screen Printing, Display and Packaging Markets. 8mm Coroplast is a High-Quality Polypropylene Twin-Wall Profile Sheet For Use in The Screen Printing, Display and Packaging Markets. This is an aluminum composite material (ACM) made of two sheets of .008 aluminum with a solid polyethylene core. This is a super-lightweight aluminum composite material (ACM) made of two pre-painted sheets of .005 Aluminum encasing a foamed poly interior. This is an aluminum composite material (ACM) made of two pre-painted white sheets of 008 aluminum with a solid polyethylene core. White, clay-coated, paper-faced foam board is built strong and rigid to resist denting and crushing. Resilient polystyrene core bounces back after cutting to keep the foam board uniform edge to edge. Heavy-duty foam-board with smooth, sulfite paper surface. Under laminate moisture barrier of polyethylene prevents bowing and warping. For exhibits, screen-printing, POP displays. Self-adhesive foam-board allows mounting without adhesives. Easy-peel protective liner exposes pressure-sensitive, medium-tack adhesive. Lightweight, rigid, cuts easily. Durable, rigid, warp-resistant signboard materials. Exterior & interior, multi-surface. Screen-, digital-printing. Durable, rigid, warp-resistant, styrene faced signboard materials. Exterior & interior, multi-surface. Screen-, digital-printing. Ultraboard Plus is a high-quality extruded polystyrene foam between two layers of PVC liner. Dent-, warp-, weather-resistant. Lightweight, durable. You can treat and cut Ultra Plus just like wood. Use a circular saw, router, band saw or scroll saw, and anchor it with adhesives or with screws and washers. Rigid, smooth, easily cut w/ knife. For mounting prints, and screen-printing, signs, POP, displays. Temp & light-duty use. Durable, rigid, warp-resistant signboard materials. For interior use, can be screenprinted, or digitally printed. Lightweight, white, poly-coated kraft paper-lined foam board, dense extruded polystyrene foam core. Durable, and will not warp. ASLAN FerroSoft and FerroSoft Print PVC-free, removable self-adhesive, white ferrous films transform any smooth surface into a magnetic board. Extremely flexible, it offers an excellent range of options for creating customised magnetic boards. Drytac ferro magnet compatible products are lightweight magnet-receptive materials with a smooth white paper face or vinyl face. Magnets of all kinds will stick to the face of these materials. DigiMag vinyl is magnetic sheeting for digital inkjet printing. This magnetic substrate allows you to print directly to the magnet without the need to over-laminate. Compatible with solvent, eco-solvent, latex, and UV inkjet printers. DigiMaxx is a super-wide-format, digitally printable, magnetic sheet with a white face that is manufactured in the USA. Available in 40" and 48" wide material. Also available in an 020 self-adhesive version. A vinyl coated, 030 magnetic product with a high-intensity, multi-pole magnetic arrangement. It has superior holding power on most metal surfaces. Idea as a base layer that can accept a digitally printed PSA vinyl. This product is suitable for litho, screen and UV-cure printing. A vinyl coated, matte finished, 015, 020 or 030 magnetic product with a high-intensity, multi-pole magnetic arrangement. It has superior holding power on most metal surfaces. Ideal as a base layer that can accept a digitally printed PSA vinyl. This product is suitable for litho, screen and UV-cure printing. Uncoated magnetic available in different gauges that is ideal for everything from fridge magnets, die-cut magnets, display, and automobile signage. Visual Magnetics MagnaMedia is a unique material developed by Visual Magnetics. The patented coating on the underside of MagnaMedia is embedded with ferrous particles that are magnetic receptive and attract to InvisiLock Magnet backer. Visual Magnetics ActiveWall commercial grade Micro-Iron Latex primer is a latex, water-based primer used to activate wall surfaces that will receive InvisiLock Magnet. Visual Magnetics InvisiLock Magnet is part of a indoor magnetic wall system that incorporates a magnetized base material with a non-magentized printable face material. High Impact Polystyrene (HIPS) is a versatile, economical resin substrate with dimensional stability and high aesthetic appeal. 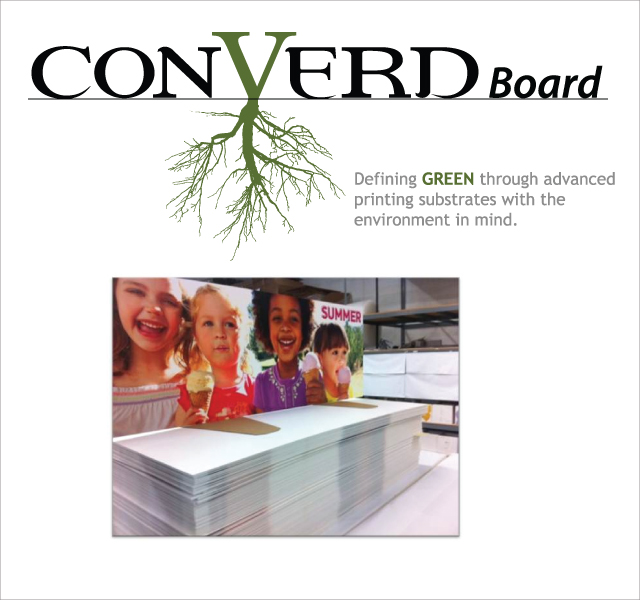 ConVerd corrugated paperboard is a bright white, fiber-based, rigid, recyclable paper alternative for signage, POP and retail applications. A clay coated surface, chipboard core and a white backing. It comes in a variety of colours and is used for poster, silkscreen, airbrush and letterpress applications. 2mm Lead and Cadmium-Free Composition. Reg density PVC. Ideal for Signs, Displays & Exhibits. Adheres to PSA vinyls. 3mm economical low density, extruded PVC sheet. Lead-cadmium-free composition. Ideal for signs, display and exhibits. Suitable for adhering PSA vinyls, routing simple shapes and painting. 3mm lead, cadmium-free composition. Reg density PVC. Ideal for signs, displays & exhibits. Adheres to PSA vinyls. 6mm Lead and Cadmium-Free Composition. Reg density PVC. Ideal for Signs, Displays & Exhibits. Adheres to PSA vinyls. 10mm Lead and Cadmium-Free Composition. Reg density PVC. Ideal for Signs, Displays & Exhibits. Adheres to PSA Vinyls. For high-end digital print applications. Lead-, cadmium-free. For UV-direct to substrate flatbed printers. PoP, display work. Extruded rigid, light weight sheet with a smooth, glossy, hard surface finish on both sides. It provides long-term outdoor durability and is perfect for advertising, construction, POP signs, displays and more.